Mr. Boomer and I have upgraded our sleep experience the last three weeks. Remember that new bedroom set I got a few week ago? The bed frame is now home to a new TEMPUR-Contour Signature mattress and Advanced Ergo Adjustable Base from Tempur-Pedic. It’s true that sleep disturbances are more common as you age. With our old mattress, it wasn’t uncommon to have 1-2 nights a week where at least one of us wasn’t able to get a good night’s sleep. It could be because the dog was jumping up and down from the bed, one of us went to the bathroom, hot flashes or just because we had an old, uncomfortable mattress. Whatever the reason, it seemed unusual to sleep the entire night! Now, we’re both in dreamland all night. What a pleasure to wake up refreshed and ready for the day! My back no longer hurts from a mattress that didn’t provide the right support. Even our dog prefers the new mattress. Charger has abandoned his doggie bed on the floor and is sometimes in the bed before we are. He stretches out and seems to really be enjoying the support of the cushion layer. I am no longer awakened by my husband (or dog) getting in and out of the bed. You’ve probably seen the commercial where the wine glass is set on one side of the bed and someone jumps up and down and the wine doesn’t spill. I haven’t specifically done THAT, but the motion does not transfer! The adjustable base is a luxury we’re still getting used to, but quickly! We love it for reading in bed and not ending up with a pain in the neck. The massaging feature is probably not something we’ll use much but it’s fun. 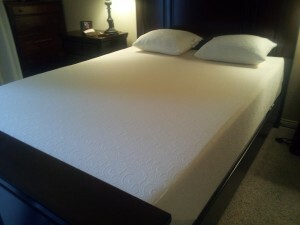 You can Have a Tempur-Pedic Too! 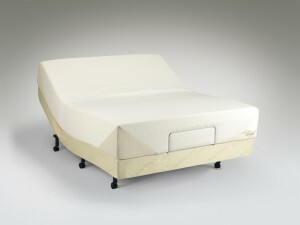 If you’re in the market for a new mattress set, check out the Tempur-Pedic products. One lucky reader won’t have to buy their own TEMPUR-Contour Mattress and Advanced Ergo Adjustable base. I’ll be back with more on that later this week. Until then, try to get a good night’s sleep. I know I will sleeping well! Disclosure: I’ve partnered with Tempur-Pedic to help promote the TEMPUR-Contour Signature mattress and Advanced Ergo Adjustable Base. This includes compensation for my time commitment to the program including writing about my experience and hosting a contest where the prize has been provided by Tempur-Pedic. All opinions stated are my 100% mine! I wrote about this last week. Well, not about the brand, but the overall expense. I find it hard to believe that people will cheap out on something they spend almost a third of their lives doing. Of course, the Tempur-Pedic may be a bit out of some people’s price range, but that doesn’t mean they should go for the cheapest mattress available to them. Eric, I agree that this is something that it is important to have quality and not cheap out. Another is shoes. Yeah, I don’t know how women can wear some of those things. Who wouldn’t want a good night of sleep? I understand the tempur-pedic retains heat. In other words tends to be warmer in summer versus in winter. Is that true? We haven’t found it any warmer than our old mattress. It does feel denser (if that makes sense), so maybe that’s why people think it retains heat. I just nominated you for 19 awards before I found out about the contest. So, I need to go back and change that form to make it 25. After years of back-aches, we bought a new mattress also. It is heaven, even though it’s not a memory foam type mattress. I’m so glad you are enjoying yours. There’s nothing like a good night’s sleep! Maggie, we have been talking about buying a new mattress for two years so I’m glad this opportunity to try the Tempur-Pedic system came along or we’d still be suffering! Sounds great! I could use that feature where the movement doesn’t transfer as I flip around like a fish out of water for at least 30 minutes before I can get to sleep! Marie, it’s amazing how the rest of the bed doesn’t move; obviously related to the construction but still seems awful special. I can attest to the fact that the Tempur-Pedic is an awesome mattress! I live in the Colorado mountains where we have weather ranging from -18 in the winter to 95 degrees on some summer days, even at 8,482 feet above sea level! Since I’ve been using the tempurpedic mattress, I’ve never slept better. @krantcents – my opinion is no… the mattress isn’t warmer in the summer. I don’t believe it retains heat. We still use lighter blankets in the summer and a down comforter in the winter – like with our previous mattress. Our mattress while one of our single most expensive purchases this far in life (right behind the house and car..) is something I would do again in a heartbeat! It’s so important to have a good mattress and get good sleep..
We all need a good night sleep and something that supports our backs Wake up refreshed and no lower back pain is a perfect way to start the day. Next post: Two Year Blogiversary Winners!